The annual blitz of back-to-school ads seem to be resonating less with parents in 2017 than they did in 2016, according to YouGov BrandIndex. 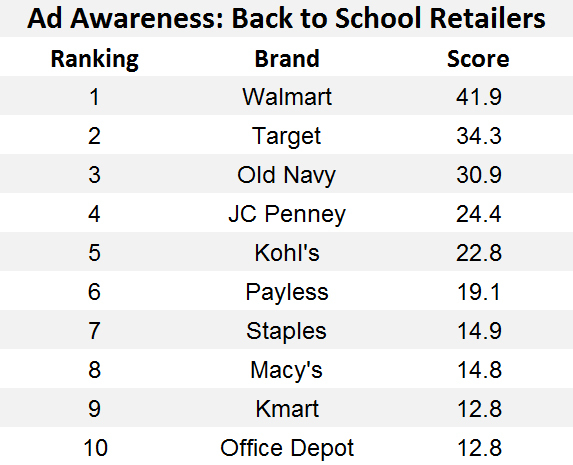 Compared to nearly 30 brick-and-mortar competitors, Walmart, Target, and Old Navy are currently recording the highest Ad Awareness levels among consumers with children under the age of 18. At present, advertising for Walmart is being recalled by 42% of parents, while Target and Old Navy are reporting rates of 34% and 31%, respectively. However, the majority of top national retailers have seen their numbers drop compared to a year ago — some by a substantial amount. At this time last year, for example, Walmart sat at 50%. Today it's at 42%. 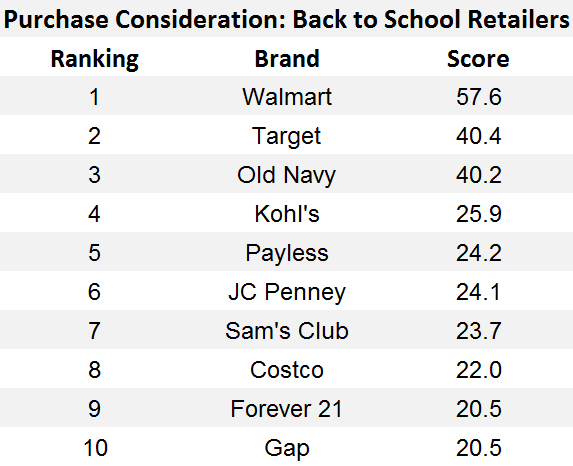 Walmart, Old Navy and Target are leading the key Value and Purchase Consideration metrics with parents, while most other retailers are clustered together below the three frontrunners. A collection of other major national retailers is grouped behind the three leaders, most of which have not made meaningful gains from one year ago with parents. In fact, none has made a significant gain versus the same time period last year in Purchase Consideration — YouGov BrandIndex’s measurement of potential future sales. In other words, most retailers are having difficulty breaking out with parents to consider them for their next purchase. Only one retailer made a significant gain in Value perception: Dillard’s. That said, retailers do display a wide range of Value perception scores from parents. 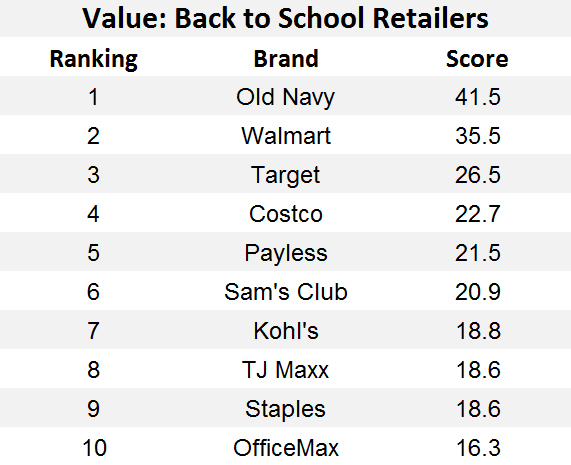 Rounding out the top 10 on Value perception after the top three are Costco (22.7), Payless (21.5), Sam’s Club (20.9), Kohl’s (18.8), TJ Maxx (18.6), Staples (18.6), and OfficeMax (16.3). Methodology: For this research, YouGov interviewed adults with at least one child under the age of 18. Each major retailer has been charted with three of YouGov’s most relevant scores: Ad Awareness ("Which of the following retailers have you seen an advertisement for in the past two weeks? "); Purchase Consideration ("When you are in the market next to purchase from a retailer, from which of the following brands would you consider purchasing? "); and Value ("Which of the following retailers do you think represents good value for money? ").